New 12 inch 8 day chalet by Hekas featuring a bavarian beer garden. 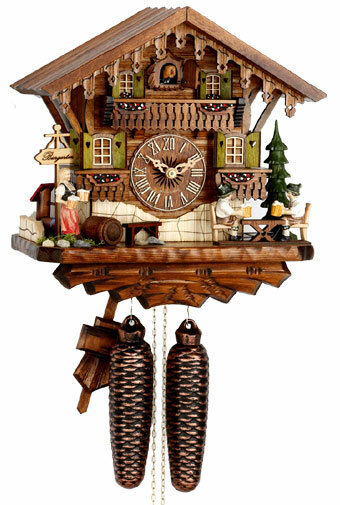 Clock features moving beer drinker, wooden hand carved figurine of bavarian waitress, carved solid wood roof, laser cut windows and shutters. Nicely decorated with wooden barrels & wooden trees. Beerdrinker lift their mug , when the cuckoo calls. 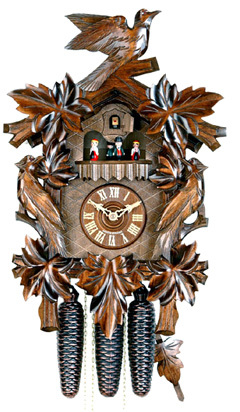 Clock also features wooden hands, wooden dial, wooden handpainted cuckoo bird. The workmanship on this clock is outstanding. Notice the thick carved base of the clock as well as the solid wooden roof and wooden rafters.